Superior Paint and Powder Coating Limited are specialist finishers and polyester powder coaters of architectural aluminium extrusions and fabrications. For many years Superior Paint and Powder Coating have been the preferred powder coater for some of the UK’s leading manufacturers and installers of windows, doors, curtain walling and architectural aluminium products generally. A large number of leading aluminium fabricators and installers trust Superior for high quality powder coating, very competitive pricing and market leading service levels. finishing of architectural aluminium, steel work, galvanised steel, mild steel and other materials. With many years experience in their field, Superior offer high quality powder coating services to the UK fenestration and building industry as well as niche markets. 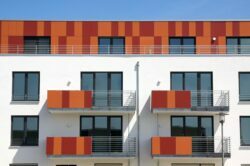 Superior have been involved in powder coating architectural aluminium systems in some of the country’s finest commercial buildings as well as painting vast volumes of aluminium for the residential home improvement market. They are a long standing Qualicoat Approved Applicator and a BS EN ISO 9001 registered company. Approvals are held with all the major and industry leading powder manufacturers including Akzo Nobel, Interpon, Syntha Pulvin, Tiger, Axalta/Dupont, IGP and PPG. The powder coating service offered by Superior and trusted by manufacturers and aluminium systems companies extends beyond bar length to also powder coating and finishing of aluminium panels, pressings, cladding systems, louvres, fabricated steel and aluminium constructions and rainwater goods. Their extensive and highly modern and efficient finishing plant is designed for optimum painting effeciency and quality producing finished extrusions of the highest paint quality. Additional services include an on site finishing service which serves the refurbishment and repair market for painting on site. This service is particularly useful where existing retail premises are taken over by new occupiers and the existing colour of the screens or doors needs changing to reflect a new corporate identity. Unlike many other powder coaters, Superior Paint and Powder Coating are able to coat anything from a single aluminium block, short bars as well as complex shapes and large sizes. With over 100 years combined experience in the finishing of architectural metalwork, Superior enjoy and excellent reputation and long-standing relationship with providers of aluminium services to fenestration and construction.